After my sweater-progress post last week a few of you inquired again about the pattern and the yarn. Well, I can tell you that the yarn comes from Lismore Sheep Farm in Nova Scotia, and is a wooly sheepy yarn that works well at aran weight. It is quite similar to other homegrown woolen yarns like Briggs & Little. It works wonderfully for cables. The pattern comes from a book that I never get tired of talking about. This is the “Portland” pullover from the book A Fine Fleece, by Lisa Lloyd and published by Potter Craft. I reviewed the book a couple of years ago when it was first released and it has become one of those books that I constantly take off of the shelf just to look at. Ostensibly it is a book of patterns for handspun yarn, but all of the patterns appear with samples made up of commercially-available yarn, so it works very well as a set of patterns for a variety of yarn weights and (mostly woolen) fibres. Many of the projects in the book are sweaters – I think about 18 if I counted correctly – and many also involve cables and texture, and relatively traditional construction. Still, there is a sort of town-and-country feel about the whole book and it is one of the few knitting books I’ve every come across that I would knit the entire thing without much hesitation. So, I have decided to do just that. About a month ago I made the decision to permanently integrate this book into my knitting schedule – I will keep a Fine Fleece project on the needles at all times until I knit the entire thing. I’m guessing this’ll take me a few years, and I’m cool with that. The ladies at the Purple Purl have undertaken a book challenge to choose a book for an entire year – which I have complete and utter admiration for. I think I could do this book in a year and I think I’d learn a lot in the process, but I want to allow the challenge to fit in with the rest of my knitting life. Are there knitting books out there which you could see knitting the whole works? Something to challenge and inspire? Hmmm…very interesting challenge…I like it! I wonder if there is a book I could commit to knitting through. PS- LOVE the colour of yarn you chose. I just bought “Lace Style” for the cover sweater, and there are a few other things in there I’d actually contemplate knitting, albeit with some changes. I honestly find more patterns I want to tackle in most Knitty issues than in many books. Just picky, I guess! This is exciting! It will be fun to follow your progress. What a great idea. Question for you: You’ve knit a fair bit with B&L, how does it feel to wear? Which kind do you prefer? I’m actually in the midst of knitting the trinity vest at the moment plus I just gifted “A Fine Fleece” to a good friend in the beginning of March. I LOVE this book and I agree with you wholeheartedly that it is a book where you want to knit every pattern between the covers! That is exactly what my friend said when she got it as well. Interesting project, to knit an entire book. I was already planning on knitting the oak socks when I finish the trinity vest. Maybe I’ll end up doing the whole book along with you. Excellent idea!…Your sweater looks amazing! hmmm. might just have to add that book to my collection of books I’m not knitting from at the moment. I also adore almost everything in A Fine Fleece. Everything is so beautifully designed and well presented. Another book I can see myself knitting every single pattern out of is Wendy D. Johnson’s Socks From the Toe Up. I’m a sucker for a good toe-up pattern and every single pattern in the book is lovely and wearable. I’m hoping her new book will be the same way. I think A Fine Fleece would be that book for me, too, actually. I don’t like to commit like that, though 🙂 because my knitting fancies are always changing from project to project. Well, I *do* have at least 4 sweaters from various sources *coughKNITTYcough* that I want to do. Probably more — I’d have to count the printouts. Hmmmmm….pondering the potential of this sort of commitment. It would require a much larger yarn allowance than I currently possess, so maybe next year. I’m gonna have to get my hands on a copy of “A Fine Fleece”. It sounds like something I’d love to just feast my eyes on. I would knit every project in “The Opinionated Knitter” – if I owned it. I keep checking it out at the library. 😉 Of course, that would probably take a few years, but oh, what great years they would be. Enjoyed your blog, will be stopping by again. Wow – what a great goal and a nice way to stay focused. I obviously need to spend more time perusing knitting resources to become educated and inspired. Altho you’re doing a fine job on the inspiration front and certainly contributing to my education as well lol. “The Eclectic Sole”. by Janel Laidman. I’m going to have to check out “A Fine Fleece”, though. Your sweater is gorgeous. I too want to knit all of the socks in Socks from the Toe Up by Wendy Johnson, although I’ve only done one pair so far. 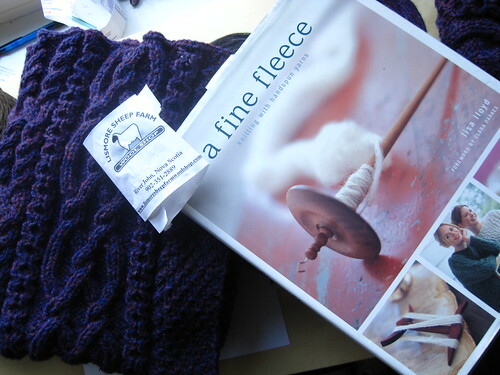 Not to worry, I own the book and have lots of time in my knitting future, so I’m not worried about the timeframe. I just love those socks and want to make them all… eventually. Wow! An impressive challenge indeed. If I were to take on such a crazy, lofty challenge it would be either Victorian Lace Today (now that would be crazy!) or Sock Innovation by Cookie A. I don’t have A Fine Fleece. I’ll have to give it a look. I’ll be cheering you on from the sidelines! I’ve toyed with making all the Eunny Jang patterns I can get my hands on. Of course doing all the EZ patterns seems like a very good idea to me too. I’m working my way through a Debbie Bliss book on baby knits but I think, given your very positive review I will check out A Fine Fleece at my first opportunity! Would love to devote a year to Ann McCauley’s “Together or Separate”. I loved it so much I bought two copies — one for me and one for my mother. Definitely want to make 8 of the 17 projects. So how many are on my needles at the moment? Uh… none. And how many are in the active queue? Uh … none. Thank you for suggesting this goal! Now if you’d just figure out a way for us to knit in our sleep — but only the boring parts. I defintely want to be awake for the fun stuff. I too love Lisa Lloyd’s book. My goal is to spin the yarn for each of the sweaters in her book. So far I’ve only knit projects using commercial yarn, but everyone of these sweaters just begs for handspun. Don’t think I could do that in a year, more like ten will be required, but I’m fine with that. My first big retirement project. Your sweater is amazing! I have been salivating over it in every post, so I had to buy the book. I can’t wait for it to arrive although I fear I’ll be looking more than knitting because I do get daunted by big projects. Congrats to you! Oh my god, that’s an amazing idea – and actually one I thought about doing when I first got the book. I can’t wait to see how it turns out. Sock Innovation, Knitting on the Road and Knitting Vintage Socks would work for me. It’s harder for more general books though as I’m plus sized so have to be very particular. I could probably knit a book’s worth out of Big Girl Knits and More Big Girl Knits though.